We usually go on the "Polar Bear Run" on the 1st of January. Most years it's wet, in 2004 it was snowing, we took the four-wheel drive truck. This guy took his Norton. There was also a Ural with sidecar and a dirt bike, and that was it, 3 bikes total.. 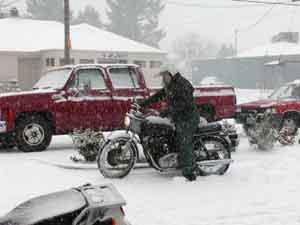 This guy had ridden about 4 miles to get here but did it when the snow was only 1-2" deep. Trying to go home the snow was 4" deep and the bike kept falling over. After about 6 blocks he broke the exhaust pipe loose in another fall and accepted a ride home in the back of our truck.